Vintage goods have been super popular for quite some years now, almost every weekend you will find some sort of vintage market of fair somewhere, including food trucks, coffee and live music. The problem with these markets is that they are too trendy, everyone is looking to buy the same things, and the sellers know that what they are selling is popular, and therefore most of the stuff is usually way too expensive. On the other end of the scope are the old fashioned car boot sales or thrift shop where you really have to be a pro to find anything nice, and where most of the stuff is just plain junk, or at least in my eyes. 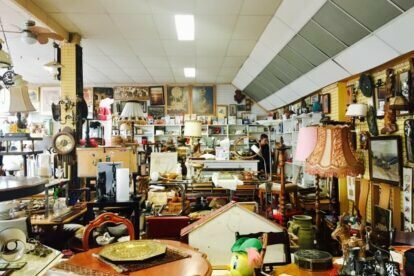 So you can imagine how happy I was when I found out about Kringloop Gordelweg, a thrift shop full of great stuff, and best of all, there is lots and lots of it. You should be able to find anything here, and you can easily spend a couple of hours between aal kinds of old furniture, clothes, and other strange items. Of course some of it is expensive, and some of it is worthless, but I dare to say that most of the stuff here really is quite good!